The 9th edition continues to be personally relevant, interesting, and scholarly. The authors' unique quest for a careful balancing act of leadership materials helps students apply theory and research to their real-life experiences. 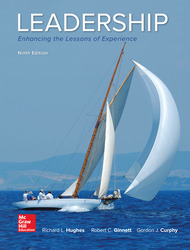 Leadership: Enhancing the Lessons of Experience, 9e, consists of 16 chapters, four of which cover specific leadership skills and qualities covered in each of the books four sections. CONNECT: A highly reliable, easy-to-sue homework and learning management solution that embeds learning science and award-willing adaptive tools to improve student results (applied & practical, results-driven technology). Chapter 1: What Do We Mean by Leadership?